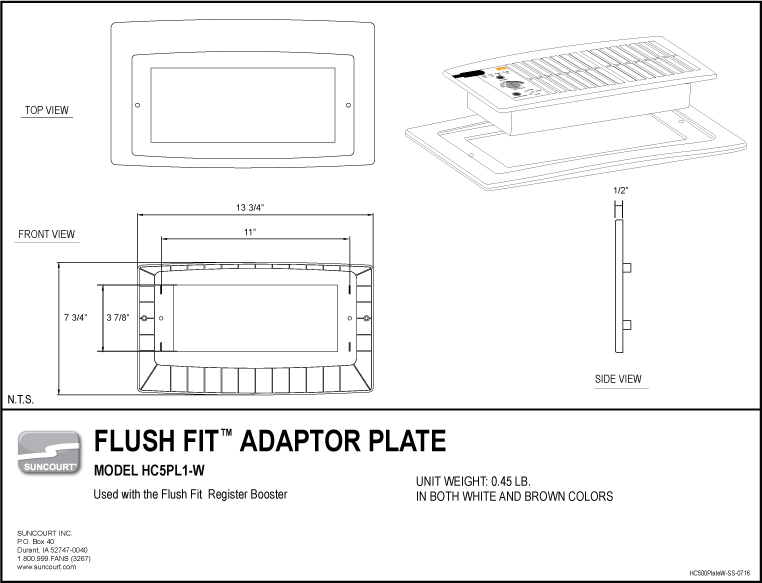 Insert the HC500 Flush Fit Register Booster™ into the adaptor plate. The small tabs on the side of the Flulsh Fit Register Booster™ should snap into place when unit is installed in the adaptor plate. Plug the small molded end of the power cord into the top of the Flush Fit Register Booster™. Plug the wall transformer end of the power cord into a 120 Volt AC outlet. Follow directions for operation settings before placing in register. Remove floor register and replace with the Flush Fit Register Booster™ and adaptor plate. 1. Locate and drill the 6” X 12” or 4” X 12” or 6” X 10” wall mount holes using a 3/16” drill bit. 2. Drill (two) holes with a 3/16” drill bit from the bottom side of the Flush Fit Register Booster™ grille. 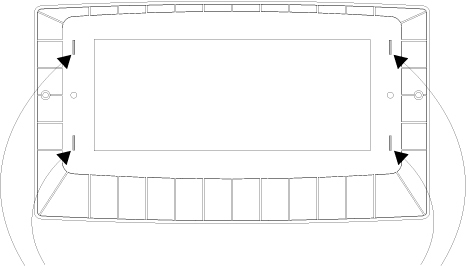 The holes should be drilled in the pre-molded location as pictured below. 3. Plug the small molded end of the power cord into the top of the Flush Fit Register Booster™. 4. Plug the wall transformer end of the power cord into a 120 Volt AC outlet. 5. Follow directions for operation settings before placing in register. 6. Remove the wall register and replace with the assembled Flush Fit Register Booster™ and adaptor plate.